The Equinox mimics its namesake by being either the longest compact SUV or shortest mid-size SUV. Depending on how you choose to categorize it, the Equinox either outperforms or underperforms when compared with the competition. However, sales figures don’t lie and as of June 2017, Chevrolet has sold close to quarter million Equinoxes. With above average reliability, plenty of seating comfort and room, and adequate performance; the Equinox is a solid SUV and a practical choice. There are roughly 30 SUVs the Equinox can be compared with at its price point. That’s a lot of competition. Some are sleeker, higher performing, and more spacious. Where the Equinox shines is its reliability. It may not be the best looking SUV in the segment, nor the quickest. Its 4.5 out of 5 predicted reliability score from JD Power makes it one of the most reliable SUVs on the market. You would be hard pressed to find such a well-rounded package with above average reliability at any price point. Most drivers will be unimpressed by the performance provided by the 2.4 Liter inline 4 cylinder engine. It’s slow in a straight line and the paired six-speed automatic transmission is sluggish and hesitant to downshift. Of course, fuel economy is much better with this option at 25 mpg combined, though it is still less efficient than many competitors. We think the Equinox is too heavy for this engine option, but there is enough power for everyday use. Upgrade to the 3.6 L V6 and the Equinox improves its straight line acceleration by 2.5 seconds from 0-60 mph at 7.1 seconds. The obvious opportunity cost is fuel economy at a combined 20 mpg rating. The ride quality in the Equinox is surprisingly quiet and comfortable, with little road noise and impressive shock absorption. The handling isn’t bad either, we wouldn’t call it agile or athletic. 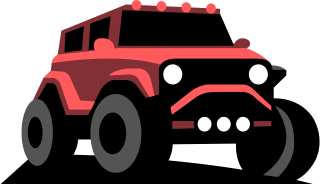 Considering its soft ride, it doesn’t suffer from excessive body lean or bounce as many other SUVs that trade performance for comfort. There are better handling alternatives like the CX-5 or even Ford Escape but the Equinox handles well enough to suit most drivers’ needs. 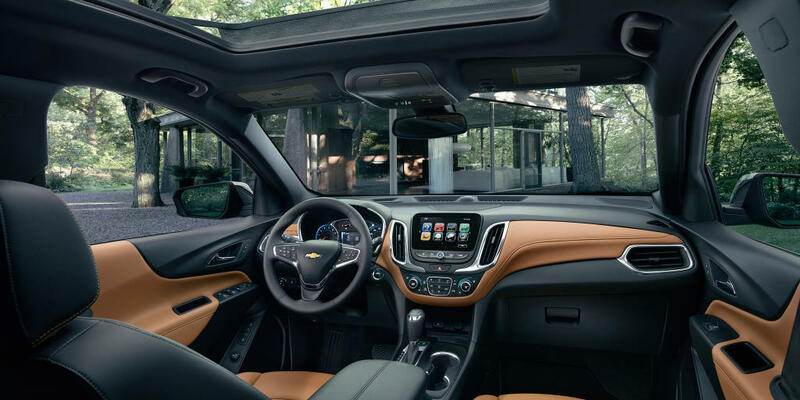 Take a seat inside the Equinox and you’ll find a basic interior with plenty of room. The materials found throughout the cabin are mostly cheap, hard plastic. Leather seating is only available on the top trims and replaces the standard cloth with high-quality perforated leather with contrast stitching. However, this doesn’t improve the quality of the rest of the dash. The second-row seats recline and slide to offer plenty of room and comfort for up to three adults. The standard touchscreen is responsive and simple to use. There are plenty of analog controls to manage a variety of functions in the cabin, only some of which are useful. 4G LTE wifi connectivity is standard, as are USB ports. Unfortunately, Bluetooth streaming audio is only available in Premium and LT trims, which makes the Equinox one of the few SUVs in its class that doesn’t offer standard Bluetooth connectivity. We guess you’ll have to resort to using an aux cable to take advantage of unlimited streaming audio. Cargo capacity is slightly below average for the class at 63.7 cubic feet with rear seats folded and 31.5 cubic feet behind rear seats. The extra space for second-row passengers will be a welcome trade-off for some, who need the space for adults. We think the Equinox has an average interior for the class with above average second-row seating. The Equinox is an average looking SUV for the crossover class. Like most of its competitors, it looks like a lifted and stretched station wagon. In the front, a large, two-piece grille is flanked by projector beam headlights and optional fog lamps. The rear is rather plain looking with a single exhaust outlet and standard tail lights. The side profile isn’t much better, the fenders are flared to give the Equinox an aggressive appearance that doesn’t fit the overall design. The optional Midnight and Sport Editions look much better with black accents and black 18in wheels, but we wouldn’t call the Equinox a particularly handsome SUV. Consumer Reports offers a 3 out of 5 predicted reliability score, though according to their data, it’s most likely a result of poor reliability in the 2007-2011 models. Recent models have fewer known issues and major problems. JD Power awards the Equinox with a 4.5 out of 5 reliability rating, one of the highest we’ve seen. The NHTSA has issued no safety recalls for the Equinox and only 35 Technical Service Bulletins. In light of the 273 TSBs issued for the 2011 model, the Equinox has improved its reliability drastically. We believe the Equinox is a reliable choice for the segment. The Insurance Institute for Highway Safety awards the Chevy Equinox with perfect crash test results. The National Highway Traffic Safety Administration gives the Equinox a 4 out of 5-star overall rating, with 4 out of 5-star ratings in frontal crash and rollover categories. The Equinox is equipped with six airbags, including side and rear head airbags. The airbags are pressure sensitive and will only deploy if a passenger is sitting in the adjacent seat. Driver assistance features like lane departure warning and blind spot monitoring are only available on the top two trims as an option, a disappointment considering many of these features are becoming available or standard on most vehicles today. However, due to its relatively low price, we still approve of the Equinox as a safe crossover SUV. Based on the Equinox’s two available engines, we chose two strong competitors to compare head to head. The first, for the 2.4L Equinox, is the Mazda CX-5. Even without a turbocharger, the 2.5 Liter inline 4 cylinder in the CX-5 makes more horsepower and torque than the 2.4 L Ecotec found in the Equinox. The Equinox is also a few hundred pounds heavier. Because of this, the CX-5 is over a second quicker to 60 mph than the Equinox. All this while retaining superior fuel economy to the Equinox with a combined rating of 27 mpg. The entire automotive industry seems to unanimously agree that the CX-5 is the best handling compact SUV. We concur. Its body remains flat when cornering and the steering weight and feel are unmatched in the segment. However, the ride isn’t quite as comfortable as the Equinox as a result, nor is it jarring. The CX-5 cabin is quiet, but not as quiet as the Equinox. The CX-5 also comes standard with safety and technology features that are costly upgrades in the Equinox. The Equinox has a far superior reliability rating, though Mazda generally has a great reputation for reliability. If we had to choose between the two, it would be a tough choice. For the performance oriented driver, we’d have to choose the CX-5 for its superior driving dynamics. For the everyday driver, the Equinox’s jack of all trades character with bulletproof reliability makes it the practical choice. Starting $24,995, the 2.0L turbocharged Ford Escape SE is a potent competitor to the 3.6L Equinox. It delivers equal straight line acceleration at 7.1 seconds to sixty. Fuel economy is better in the Escape at 25 mpg combined. Like the CX-5, the handling in the Escape is composed and sedan-like. It provides an agility that the Equinox lacks. Yet, ride quality suffers as a result. The interior in the Escape has an improved finish, with a leather-trimmed dash that makes the Escape feel more upscale than the Equinox. The second-row space is a little better in the Equinox, though the Escape’s second row does slide and recline as well. Technology in the two is evenly matched as both provide wifi connectivity, though we have to give the edge to the Escape. The new FordPass app allows you to unlock and start your car without your keys! Meanwhile, the Equinox doesn’t even allow Bluetooth streaming in lower trims. We think the Escape is a potent alternative to the Equinox and you should consider it before buying the Equinox. The Chevrolet Equinox L trim has a base MSRP of $23,995 and arrives equipped with remote keyless entry, a rear vision camera, OnStar 4G LTE with wifi hotspot, power adjustable front seats, and passenger sensing airbags. The LS trim starts at $26,405 and doesn’t add much except SiriusXM satellite radio and the availability of certain upgrades like all wheel drive and a universal tablet holder. The LT trim begins at $27,645 and includes tinted glass, heated power adjustable mirrors, luggage rack side rails, different 17in aluminum wheels, Chevrolet MyLink infotainment system, and the availability of leather seats, technology package, convenience package, and Driver Confidence Package. The Midnight Edition and Sport Edition are available for an extra $1,695 that buys you memory settings for seats and mirrors, perforated leather seats, exclusive color options, upgraded 18in wheels, and special appearance accents. Both require the purchase of the $1,300 dollar Convenience Package, which brings upgraded power driver’s seat, remote vehicle start, auto climate control, heated front seats, and leather-wrapped steering wheel with additional controls. The $890 Technology Package adds MyLink with Navigation, a premium Pioneer 8 speaker sound system, and requires the purchase of Convenience Package as well. A power programmable liftgate is available on LT and Premium trims equipped with the Convenience Package for an extra $500. The $30,935 Premier trim supplies heated front seats, perforated leather seats, automatic climate control, front fog lamps, power mirrors, 18in aluminum wheels, remote vehicle starter system, and availability of driver safety features like rear cross traffic alert, blind spot monitoring, and forward collision warning. All Wheel Drive is available on all but the L trim for an additional $1,750. An upgrade LFX 3.6L V6 is also available though pricing information is not available on the Chevrolet site.